I recently added a new piece of equipment to my dojo. The bag weighs about 70 pounds and supposedly has an extra soft core, but it seems pretty hard when I kick it. Maybe it just needs to be broken in (or I need to strengthen my feet and legs). Hopefully this will be useful to help improve my kicks. 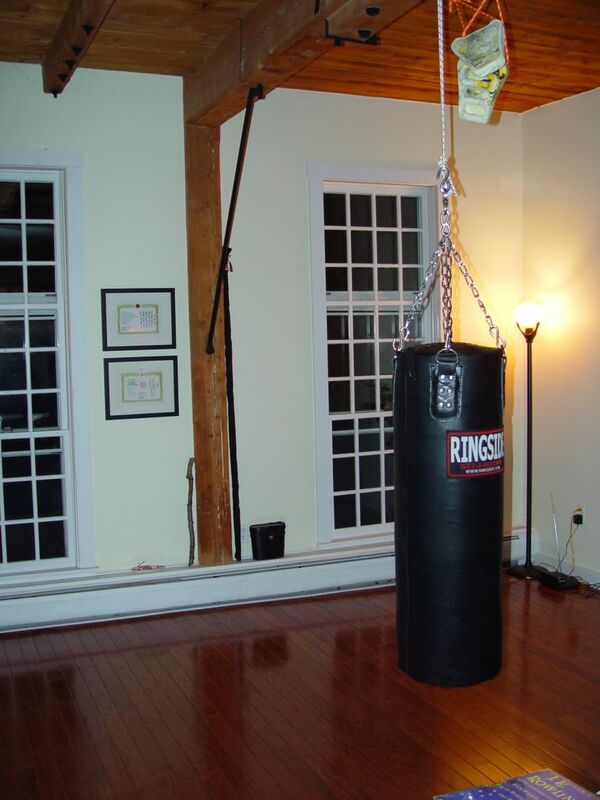 The only drawback is hitting the bag makes a fairly loud slapping noise, so I need to use it at times during the day when it is less likely to disturb the neighbors. dont do it at night time thats for sure! wow! That's pretty cool. Glad to see you are taking advantage of your space. Your hard practice is noticed at the dojo! Where'd you put the sofa? Where'd I put the sofa? I'll put up another picture to show the room from another angle.